Why Playing It Safe Can Be Risky Business | Choose Your Energy: Change Your Life! 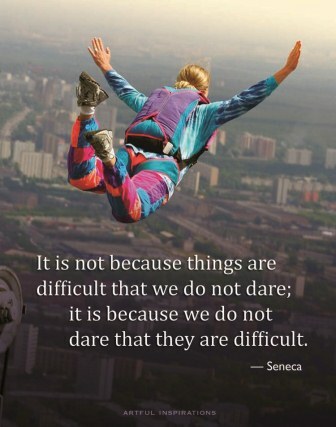 Many of us think if we dare to try something new or take a risk in order to expand or improve our lives, we won’t make life better, we’ll make it more difficult. We tell ourselves it’s easier to stick with the status quo because it’s predictable. Our preference for the familiar is so strong, it’s actually cited as one of the most common reasons people chose to stay in dysfunctional—even abusive—situations and relationships. But what if the familiar just isn’t working for you anymore? We’ve all heard the saying “insanity is doing the same thing over and over again and expecting different results.” You reach a point where you can no longer escape the truth: you know in your heart what’s really making your life difficult is constraining it with the same old limiting beliefs and destructive habits. Fear is keeping you small—trapped in a lackluster life you’ve come to loathe. So what if you do recognize the status quo just isn’t working for you anymore? What if you realize it’s keeping you stuck in a life you’ve outgrown? What if you’ve had enough of the familiar and you’re ready to take action to try something new that could help you break through the old barriers of limitation and lack that have been holding you prisoner in a life you abhor? When the Universe loves you enough to keep pushing you outside your comfort zone, it’s time to embrace the grace you’re being offered, face your fears, stop resisting and open your fearful heart to new possibilities. Ready to live a life of generous, effortless, gracious flow filled with faith, hope, prosperity peace and joy? Whenever you have the sense that you are stuck or blocked, a real-time Flow Scan can help you identify which aspects of your thinking would benefit from recalibration and what form that might take. Below you will find a snapshot of the worksheet used for the scan. In my book, Choose Your Energy: Change Your Life!, I provide a variety of scans to help you recognize when you are out of alignment and get yourself back on track, including the Flow Scan. Click here to download a FREE full-size, color version of my Flow Scan, along with full-size, color versions of all of the other illustrations and scans included in my book. Pay attention so that you notice quickly whenever you are feeling stuck. Invest your energy in assessing the fear-based lies and illusions that are blocking you, identifying any feelings of distrust, despair, scarcity, panic, or misery. Determine what baby steps will restore your life to a love-based truth and reality of faith, hope, prosperity, peace, and joy. Assess your results and continuously refine and expand your action plan to fill your reality with the truth of love-based flow and minimize succumbing to the lies and illusions of fear-based blocks. You’re worth the effort. With practice, you will become adept at noticing whenever you’re feeling stuck or blocked and quickly taking action to restore flow. This way of living mindfully will become a healthy new habit through which you will build the less stressful, more fulfilling life you dream of. Start today by identifying one small step you can take in the direction of your dreams. Even though trying something risky or new may cause your pulse to quicken and your palms to sweat, the rewards will far outweigh any perceived benefits to simply ‘playing it safe’. In fact, playing it safe is actually the riskiest path because through it you risk wasting your one precious life. You risk missing entirely the reason you are here. To be who you fully are at your core with delight and abandon. To let your light shine to brighten the way for all of us. You’re the only you we’ve got. A precious natural resource never to be wasted or taken for granted. BABY STEPS MAKE A BIG DIFFERENCE! Slow and steady produces meaningful, lasting results. Vast forced output is rarely sustained. Great strides of lasting value involve myriad baby steps over time. If the conceivers of the Taj Mahal had believed fast was the only way to get there, it would have crumbled in the first storm. Easy does it. Letting any shifts be as organic as possible is key to more substantive, longer lasting results. Begin with one tiny baby step toward one small desired change. No amount of progress is too inconsequential to celebrate. Each step forward is an important opportunity to stop, consider what you’ve learned, examine your new tools, realize your new strengths, and embrace with gratitude the joy that will take you to the next step. Celebrating each success is key to fostering the constructive core energy that will keep moving you forward. Noticing and demonstrating love, respect, curiosity, compassion, and gratitude for any resistance to change is as important to moving forward as celebrating your successes. Before you know it, you will have left behind your former life of limitation and lack. You will have built your dream and it will last your whole life through. What will you dare to do today with your one precious life? This entry was posted in All My Blog Posts, Authenticity & Purpose, Force, Flow & Baby Steps and tagged Deborah Jane Wells, What are baby steps, What is authenticity, What is life purpose, What is my life purpose, What is the meaning of life, What is the purpose of life. Bookmark the permalink.